This image of the New Jerusalem is from the 14th century Angers Apocalypse Tapestry. 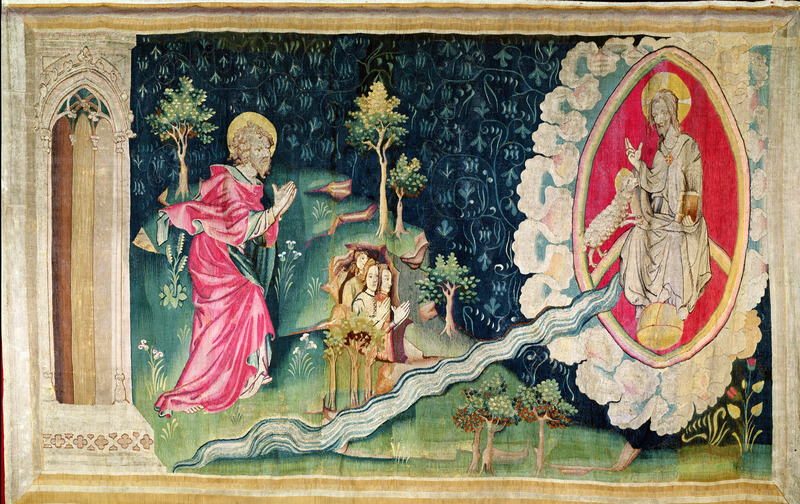 Unlike the first image in the tapestry's New Jerusalem sequence, which depicts the New Jerusalem as a city, this image depicts the New Jerusalem as the River of Life, flowing down from God’s throne amidst an Eden-like garden. As in the Trinity Apocalypse, God and the Lamb (Christ) remain in their mandorla (the almond-shaped aureoles of light) and are not mingling freely on earth. John, however, has left his shelter, symbolising his new-found understanding. His exit from the shelter—from which, in the Angers Tapestry, he has thus far viewed the whole of the Revelation—may represent symbolically the removal of barriers between the divine and the human realms that the coming of the New Jerusalem signifies (Revelation 22:2–4).